to go with the program, it wasn’t necessary to keep their attention. I definitely recommend this program and the ones that follow: “Your Inner Reptile” and “Your Inner Monkey.” While the video never specifically used the term “homologous structure” the vast majority of it focuses on the limbs of vertebrates and their search for a fish that had a similar limb structure. 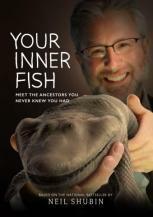 You can purchase your inner fish, or you can request a free copy from HHMI. Their website also has a streaming version of the program. HHMI also has other resources related to this program, such as additional downloadable content. Your students can watch the video and read the article “It’s a Fishapod” which provides a more detailed look at how the research on the Tiktaalik was conducted.